Today I am going to review a program called ETHMine. ETHMine is another program, which positions itself as a mining platform. It has been online for 25 days in total. The program joined Golden Stage on DavidNews.com monitor 9 days ago, and on the 20th March, it has the status “PAYING”. I have reinvested $400 in the program and will keep you updated about the payments status on our monitor. Shortly after joining DavidNews.com, ETHMine caused various reactions on our chat – the program was described both as a good one and as a program with a catch. Therefore, let's take a closer look at ETHMine to have our own opinion about it! ETHMine offers three investment plans or as they call them three different mining contracts – “Starter Pack” – 2.6% daily, “Advanced” – 2.8% and “Superior” - 3 % daily. So-called mining contracts or all three investment plans run for one year, but it is possible to exit after 24h for a 5% fee. Each of the plans is different regarding the min. and max. deposit. For the plan “Starter Pack” the amount of investment varies between $10 and $4999.99 for “Advanced” $5000 – 19999.99 and for “Superior” the minimum deposit starts from $20000 but it has no maximum restriction. You can already see, which plan has the biggest potential attracting larger audiences due to its minimum deposit. ETHMine accepts Bitcoin, Litecoin, DogeCoin, Ethereum and Bitcoin Cash. The minimum withdraw is $5. Bitcoin, Litecoin, and Dogecoin withdrawals are processed instantly, however, withdrawals for other payment methods can take up to 24 hours. Interested? Keep reading to find out more about ETHMine and its features. So, what’s the story behind the mining contracts? 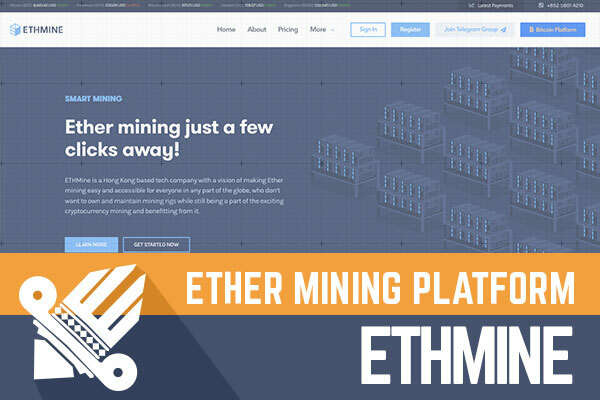 ETHMine positions themselves as a smart Ether mining platform, where everyone from any part of the world can participate in and mine Ether without owning a mining rig, or any other mining-related resource. Their mining farms are already set up to do the job for you. In short, ETHMine claims that they provide an easy way to rent hashing power. Therefore, if you are not a highly skilled person who can easily set up hardware for mining (I believe the majority who are capable of it have done it already), but still want to participate and earn profit from it, then ETHMine is the right place for you. By purchasing one of the contracts, in return, you get an excellent mining experience. Basically, you are participating in Ether mining without the need to set up and maintaining a mining rig. Want to learn more about ETHMine and the mining contract? Feel free to check the website yourself, they have prepared quite an FAQ page! Nevertheless, the admins of the program have spent more time counting on the benefits of participating in mining, rather than developing a story. However, there is a feature on the website we rarely see on HYIP websites (I would say never). On the “About” page everybody can meet the founders of the program. Does this increase credibility? I would say no, because I don’t believe that any admin would put his/her own images on the HYIP website. Regarding the certificate of incorporation, ETHMine again differs from many other HYIP programs! ETHMine claims to be a certified Hong Kong company, located in the city of Sheung Wan. If you are willing to check it yourself, feel free to do it and drop a message in the chat box. In the meanwhile, it doesn’t make a much difference for the investor since we see scamming both types of programs – with and without company certificates. My favorite part of this HYIP is the website. It is clean and simple and most importantly doesn’t feel rushed! This is kind of a website that creates trust in the service. Don’t forget it still a HYIP… The information provided explains everything you need to know. A couple of videos and good copywriting elements makes you click on the “Get Started Now”. Yes, probably I am one of the average “Joe” who is easy to convince, but they have done a good job. No doubt! When you enter the website for the first time ETHMine offers to choose from Bitcoin- Based Mining platform and the Original platform. I haven’t tried the new Bitcoin platform but seeing the good job they have done on the original platform, I guess for you who prefer transaction in Bitcoins without no distractions of dollars, try out the new platform. Has anyone tried it yet? Share your experience in the chat box! The website has an SSL certificate from GeoTrust valid until January 29, 2019. The website is available only in English. According to the information on alexa.com, the main audience is from Spain, Brazil, India, Russia, and Australia. What does the internet say about ETHMine? A good-looking, but expensive program – first people discuss the 5% exit fee, secondly, the catch - the main value is USD, ETHMine uses live exchange rate once you apply for hashing power or once you are collecting your earnings. If the Bitcoin value drops you, you know what happens. Simple as that! As mentioned ETHMine offers three plans 2.6%, 2.8% and 3% daily for a maximum deposit term of one year. Quite a while, right? As the first plan with the minimum deposit of $10 and a maximum deposit of $4999,99 is the most affordable plan due to its minimum deposit, I will take a closer look at it. Even though deposit can be withdrawn for 5% fee, let’s not include it in the initial calculations. An investment of $200 in the plan “Starter Pack” would generate a daily return of $5.20 and the break-even point can be reached within 39 days. If we imagine that the program is here to stay for some while, then after 78 days we could earn the net profit of $200 and still have the option to withdraw $190. Of course, it sounds tasty but let’s not forget we are talking about HYIP’s. Definitely a good-looking HYIP program with no signs of rush. Some might say, what is a HYIP program without risk? Decide yourself if the offer from ETHMine is acceptable for you. Now it is hard to tell what’s going to happen with this program tomorrow or the next week. As always it is totally up to admins. Therefore, if you ever decide to make any investments, don’t invest more than you can afford to lose! Have you already made an investment in ETHMine and have any useful information to share with us? Please drop a message in the chat box to share your experience! Investment plans: 2.60%, 2.80% and 3.0% daily for one year. Principal returned for a 5% fee after 24h.